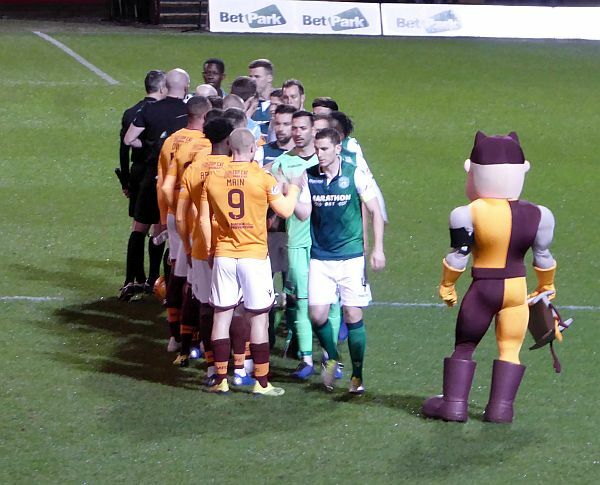 David Turnbull's goal just before the break was enough to give Motherwell a 1-0 win over Hibs at a chilly Fir Park. Gone was the lack lustre team that was knocked out the cup. In their place was a team determined to win. Stephen Robinson's promised shuffle resulted in five changes from the weekend. Campbell, Grimshaw, Gorrin, Main and Hastie were added as Hartley, McHugh, Frear, Johnson and McCormack made way. Although he visitors probably had the early edge it was clear that this Motherwell team was up for the task. Grimshaw and Campbell were like terrors in midfield and they kept up the pace throughout the game. Ryan Porteous forced Gillespie into his only save of the first half with an overhead effort before we started to carve out chances. Turnbull sent a lovely curling forward ball in the path of Curtis Main but our man fired at the ‘keeper. Gboly Ariyibi showed his pace as he skipped beyond defenders on the left wing to sprint along the dead ball line. His teasing cross was just out of Main’s reach. What proved to be the winner was a joy to behold. Jake Hastie turned his man just inside our half before racing down the right wing. His delivery found Turnbull in space and from 15 yards the ball was swept into the net. We kept up the pressure early in the second period as Liam Grimshaw had us on our feet after a scintillating midfield run that had him cast defenders to the wind. Turnbull’s effort at the end flew high. There was a late chance to kill the contest when substitute Conor Sammon had the goal at his mercy as he collected a rebound of Marciano but from a very tight angle on the bye line he hit the post. The defence stood firm as the visitor pushed up to their fans in the South Stand but Bobby Madden’s whistle sounded after five added minutes and the points were secured. A similar display at Dens Park on Saturday could produce another three points.